Welcome to Hollywood Beach, Florida, one of the most beautiful places in the state of Florida. Located in southeastern Broward County between Fort Lauderdale and Miami, Hollywood Beach is a quaint family-oriented Florida beach town. Founded in 1925 by Joseph W. young, Hollywood grew rapidly in population during the 1950s and 1969s ad is currently the twelfth largest city in the state of Florida. Young’s vision was to create an opulent city for everyone to enjoy and in many ways his vision has been realized. Hollywood Beach occupies 7 miles of beautiful pristine sandy beaches along the coast of the Atlantic Ocean. 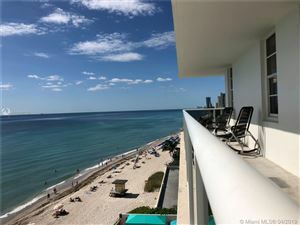 It has a newly renovated 2.5 mile paved beachfront Broadwalk where Hollywood Beach residents love to walk, job, roller-blade, or ride their bicycles. There is even eco-friendly lighting so that residents can enjoy the Broadwalk during the evening hours. For the last 10 consecutive years, Hollywood Beach has been awarded a Blue Wave Certified Clean Beach by the Clean Beaches Council. It was also named one of the Top 10 Nostalgic Promenades by USA Today, America’s Best Beach Boardwalk by Travel and Leisure in 2010, and Best Beach for Families by Fodor Travel Guide in 2009. Buyers looking to purchase a home in Hollywood Beach will find a plethora of housing options including single family homes, estate waterfront homes, townhomes, and luxury condominiums. Many homes in Hollywood Beach feature spectacular views of the sparkling blue waters of the Intracoastal Waterways and the Atlantic Ocean. Hollywood Beach residents love watching the beautiful yachts and sailboats that sail down the Intracoastal Waterways and the stunning cruise ships that leave out of the nearby Port of Fort Lauderdale. To learn more about Hollywood Beach click here. Watch the waves and beach conditions live via beach webcam click here.